We took a flight from Rome and arrived with half an hour of delay at the airport of Cairo where we would have to change flight to get to Dubai. Unfortunately the delay of the first flight was enough to make us miss our connection flight. Pictures inside the Burj Al..
Running around with passports and boarding passes from gate to gate we still didn't make it on time to get to Dubai. A few hours later they booked us on the next flight around ten o'clock in the evening and we arrived in Duabi at three in the morning, what a trip! Dubai is one big construction project and wherever you will look you will spot skyscrapers, 5 star hotels and other impressive buildings. Here people really seem to work day and night and the city kind of reminded me of that video game Sim City where you have this amazing surreal place that keeps on getting bigger with every second that passes, amazing! 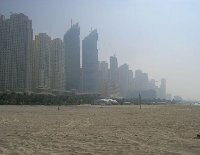 Photo of Jumeira Beach at.. 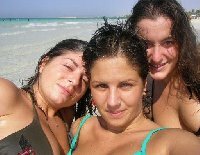 The beach is amazing and the water has a pleasent warm temperature. They are very clean and even in October, when I was there, the temperature was around the 42 degrees! Dubai is also known for its world famous Burj Al Arab hotel which is made out of pure luxury. 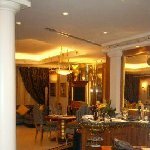 I had the chance to peek inside this 5 star hotel and it really is a magic place with a lot of glamour. You can spot golden details and accessories everywhere, even the bath tub was made out of gold! 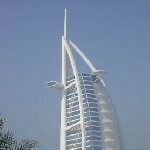 We had come to the United Arab Emirates with a group of nine people to celebrate the birthday of a friend who works in Dubai and who ended up showing us all the interesting sights of the city, the Arab suk market included where she helped us get the best bargains. At night we celebrated her birthday with a fancy dinner in an amazing Lebanese restaurant. We also got a taste of the ashisha, or narghile, a typical Arab waterpipe which is smoked after dinner, and if possibile while enjoying an amazing sunset. The twin towers of Dubai,..
After dinner we continued our evening at the Buddha Bar for a dance and a drink. On our last day in Dubai we organized a desert safari and we rented two jeeps to drive through this amazing area. The dunes were incredibly high and I can't describe in words how impressive it was looking at the sunset while the sun shattered its last rays of light over the desert sands, breath taking! We had dinner in the desert, together with other people who came along, and headed home around ten o'clock in the evening. Feeling the warm sands underneath your feet and the sun shining upon your face, was the perfect combination to end this memorable day. During our stay the Ramadan was celebrated, a religious tradition which lasts for a few days during which the people don't drink, eat or smoke during the day. We decided to respect this costume eventhough it sometimes was a bit unconvenient, especially in public places. Inside the turistic resorts you won't experience much of the Ramadan. For me five days were enough to fall in love with this amazing city and I don't know if I could ever live in Dubai but I can sure recommend it as a travel destination. 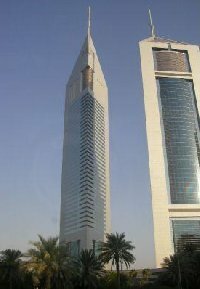 Now that the city owns the world's largest building as well so another plus to go and visit Dubai. Did you enjoy The amazing sunsets of Dubai and have you been on a holiday in Dubai, United Arab Emirates? 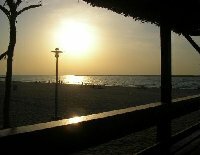 Photo of Jumeira Beach at sunset. 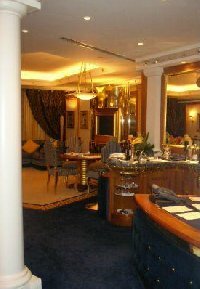 Pictures inside the Burj Al Arab of Dubai. Looking out over the desert at sunset. Skyscrapers from the beach, the skyline of Dubai. 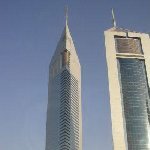 The twin towers of Dubai, one a hotel, the other one office space. Desert jeep tour from Dubai. 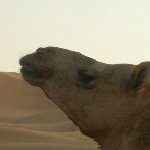 Picture of a camel in the desert of Dubai. Smoking the ashisha in the desert of Dubai. The famous Burj Al Arab. Disliked: I don't think there were any real negative points.